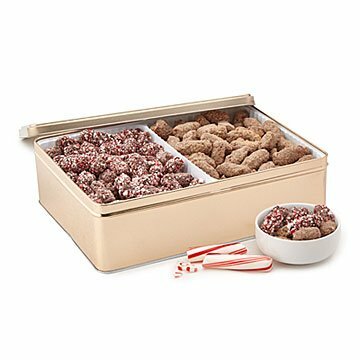 This tin comes with two flavors of chocolate-dipped pretzels: toffee and peppermint. Sometime in the mid 1500s, a German baker named Herr Franz Joseph Liebniz teamed up with a neighboring chocolatier to create a delicacy: chocolate-covered pretzels. Today, no one champions the treat like sisters Lauren Borowick and Ali Zmishlany. Their gourmet-dipped bites were inspired by baking delectable rainbow sprinkle pretzels with their mother. Now, they up the creative candy ante with two exciting flavors: toffee and peppermint. Each tin comes with a pound of each flavor, aka a lot of snacking chocolate to crunch, savor, and share with sweets-craving pals. (Or not—we won't judge). Made in Brooklyn, New York.